Nursery Rhymes Come to Life! Without a doubt, nursery rhymes formed a huge part in both my and the monkies' toddler years. I mean, who can escape singing along to 'Itsy Bitsy Spider', 'Mary Had A Little Lamb' and 'Baa Baa Black Sheep' right? So if you have been yearning to relive some of your childhood memories and/or bring these nursery rhymes to life right in front of your child's eyes, skip down to the Flower Dome at Gardens by the Bay! 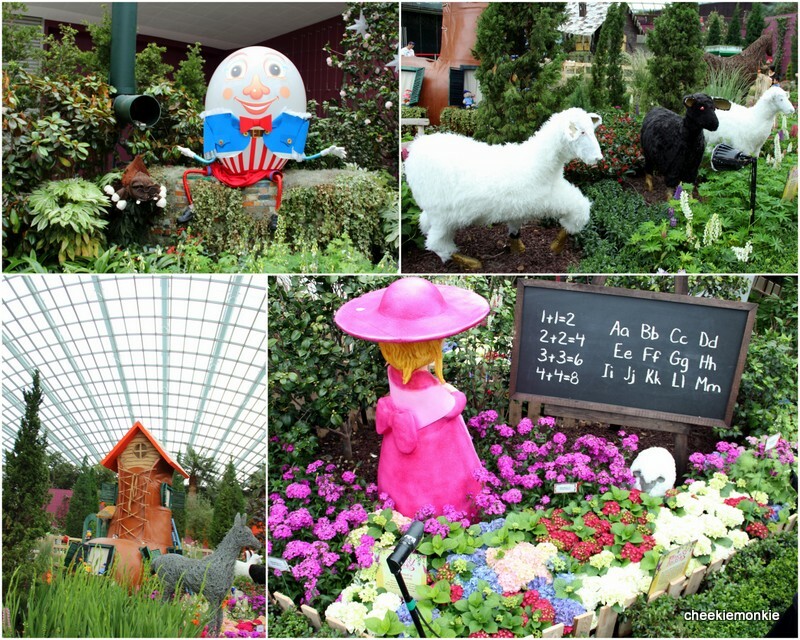 The third of six chapters in Gardens by the Bay's storytelling journey in 2015, Flowery Fun Times with Nursery Rhymes has the Flower Dome Flower Field transformed into a world filled with beloved scenes from childhood nursery rhymes and stories. So expect to see familiar characters brought to life - much like Mary and her little lamb, the old lady in her shoe, Old MacDonald with his farm animals, Humpty Dumpty, Itsy Bitsy Spider, Baa Baa Black Sheep and even pay a visit to Mary, Mary, Quite Contrary in her garden. But the one thing I loved about the floral display? Not only does it feature the usual English nursery rhymes and stories, it also included rhymes in other languages such as Tamil and Malay as well! Ale, for one, was ecstatic to see one of her favourite Mandarin rhyme, 小蜜蜂, on display and she just went '嗡嗡嗡' on repeat mode after that. Ayd's favourite Mandarin song when he was a toddler, 泥娃娃, was also painstakingly brought to life. Loved how the characters were constructed out of flower pots! Amidst a field of colourful Lupins, Delphiniums and Foxgloves, the entire flower field display was truly a feast for the eyes. Compared to the previous Tulipmania display where I felt that the gingerbread house stuck out like a sore thumb in the middle of the Flower Field, the props for Flowery Fun Times complemented the floral display really well this time around. There is a natural flow of the rhymes and stories with each linking up with one another seamlessly. So yes, all of us definitely loved it! The Floral Display runs until 19 July but the best time to head down to Gardens by the Bay will be this weekend (27 & 28 June 2015)... all because of Megapalooza! Visit with your family and friends and have a whale of a time playing gigantic board games, enjoying magic tricks and taking in wonderful performances! Watch a play with stories told by the Berenstain Bears! Look forward to colourful costumes and interesting props, and let the Berenstain Bears' special narration of honesty and responsibility move you. Admission Charges apply. For more information, visit HERE. Grab Family Package at $50 (usual price $64), which allows entry to both conservatories for two adults and two kids! Offer valid to 28 June 2015, Sunday. In celebration of SG50, local seniors (aged 60 and above) can enjoy free entry into two conservatories. Accompanying caregivers of seniors can also enjoy 50% discount into two conservatories. Valid from 1 June to 31 August 2015.